Indie Spotlight is our monthly column on self-publishing. This month Raelee Chapman speaks to Fran Pickering the indie author of the popular Josie Clark East-West fusion murder mysteries. Josie is an English expat sleuth living in Tokyo where these mysteries are set. What made you choose Japan as the setting for your East-West fusion murder mysteries? I wanted to share my love of Japan with others in a way that would be interesting and non-academic. Readers often say they enjoy the way the books immerse them in Japanese culture - especially the different cultural assumptions and, of course, the food! What was the inspiration for your first novel The Cherry Blossom Murder? The inspiration originally came from the unique and spectacular all-female Takarazuka Revue. It’s one of the biggest theatre companies in the country and yet it’s hardly known outside Japan. The Takarazuka star actresses have large and enthusiastic fan clubs with their own arcane rules, and the story in The Cherry Blossom Murder is set inside one of them. It begins when Josie Clark, expat Londoner and fan club member, finds a body under the cherry blossom on the Flower Path that runs past the stage door. Writing about Takarazuka enabled me to give readers a glimpse behind the scenes of a remarkable Japanese phenomenon, and also to show the ordinary lives of the fans. Did you always intend for The Cherry Blossom Murder to be the first in a series? It became a series because there was so much scope to write about different aspects of Japan - so far I’ve covered haiku, karaoke and, in my work-in-progress, the bullet trains. Your mystery series is self-published what led you to go down this path as opposed to a traditional publishing route? I chose to self-publish because I could see the publishing landscape had completely changed in the last few years. Self-publishing gets easier all the time and offers great opportunities to new authors. The traditional publishing route isn‘t very attractive - you spend months going cap-in-hand to agents or waiting in publishers’ slush piles. I didn’t want to do that. I publish with Amazon - KDP for eBooks and Createspace for printed books - because they offer the most complete service and access to the largest market. It’s hard at first because you have to learn a whole set of new skills, like design and formatting but it’s really worthwhile. I love being an indie author. I’m in complete control of when my books are published, what their covers look like - I use a professional cover designer - and how they’re marketed. And I don't have to share my royalties with anyone else. I find beta readers among my friends, some of whom have publishing backgrounds. They help me improve the story. I use a professional copy editor. 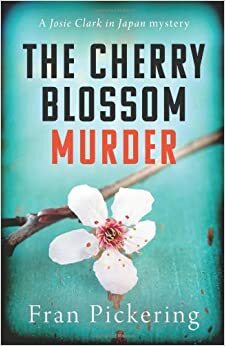 The Cherry Blossom Murder reached the quarter finals in the Amazon Breakthrough Novel Award; were you surprised by this success and did it help bolster sales on Amazon? I was surprised to do so well with my first book. The main help to sales has been the Publishers Weekly review which I won as a prize for reaching the quarter finals. I got a good review, so that gave my book a boost - people trust a review from a big name like Publishers Weekly, and I can quote it in my marketing. I would love to enter other books for the award, but sadly Amazon have discontinued it this year. How do you reach out and connect with your readership? I’m very active on social media. I have a website where I share information about my books, and a blog, where I write about Japanese events in London. I am on Twitter as well: @franpickering. How would you describe your target readership? Anyone who is interested in Japan and wants to learn more about it in a fun and non-academic way. Do you have any plans to translate your novels? Into Asian languages? Into Japanese? I would love to have my novels translated, especially into Japanese so that my Japanese friends could read them, but I don't have any specific plans at the moment. Can you tell us a little about your work-in-progress? The new novel is set mainly in Osaka, Japan’s second largest city, where Josie has been sent to work, commuting back to Tokyo on the bullet train to see her boyfriend, Dave, at weekends. When a body is found on the train, at first Josie thinks it’s got nothing to do with her, but the victim turns out to be a colleague and Josie soon discovers that there’s a lot of plotting and deception going on beneath the surface at her new office. You have a Josie Clark prequel novella for purchase. Did you write this following a request from a reader? Do comments from readers influence your writing plans? I wrote the short prequel, The Tokyo Karaoke Murder, because people who read the first book didn’t want to wait long for the second one to come out, so I gave them a novella to fill the gap. I definitely listen to what readers say in planning future books - I give bigger roles to popular characters like Mr. Tanaka, and I make sure Josie and Dave’s relationship has plenty of twists and turns as that’s what keeps people interested. Are you a full time writer? No, but while I’m working on a book I set myself daily word count targets so that I don't let things slide. You can always find the time to write if you’re committed to it. Are there any disadvantages to being an indie author in terms of doing book tours or getting adequate press coverage or placing physical copies of your books in shops? I sell my books online so I don’t try to get physical copies into bookshops. I decided at the start that online was the most effective way to sell books and I think that was the right decision for me. With bookshops you have to give a big discount and supply the books yourself, so there is very little profit in it. I’d rather stick with Amazon, where my books are sold and delivered to the customer within days without my having to do anything. Plus I sell a lot of eBooks, which are cheap to produce and delivered instantly. Instead of press coverage I try to get online coverage through book blogs and Japan-related blogs. It’s all about doing things in a way that works in the digital world in which we all now live. Many thanks to Raelee Chapman for all her hard work on Indie Spotlight over the past year. Raelee is now passing the baton to Siobhan Daiko, the self-published author of The Orchid Tree. Siobhan’s first post, in June, will introduce herself, and her novel.